If you are in the following industries, the book My Living Legacy has proven to be an extremely effective tool in building long-term client relationships and enabling you to pass on your services from generation to generation. My Living Legacy can be customized with your company logo at a minimum of 1000, whatever will enhance it for your business to give to clients. 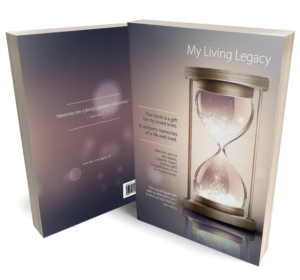 In addition, My Living Legacy is a memorable, practical and heart-warming gift item that is appropriate for all occasions including birthdays, anniversaries, and religious holidays. Susan Fielder is an author, businesswoman, entrepreneur, entertainer, and fund-raiser, and artist in the San Diego area. She is currently available for interviews. Contact her via email or call at 858.395.8466. Some satisfied users have been Hospices, Hospitals, Cancer Centers, Foundations, as well Trust departments at Banks. To order click here.